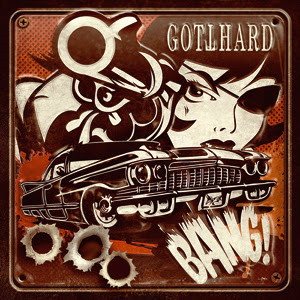 Swiss-based, hard-hitting quintet GOTTHARD are thrilled to unleash their latest studio album, BANG! in North America via The End Records. On June 24th, the band will release the digital version of BANG!, with a deluxe version containing 3 bonus tracks scheduled for release August 12, 2014. For over 20 years, GOTTHARD has toured the globe throughout Europe, North and South America and Asia in support of 14 studio and live albums, and has collected multiple gold and platinum awards along the way. Recorded at the group’s own Yellow House Studios in Lugano in the Swiss canton of Tessin, BANG! was mixed at the Dutch Wisseloord Studios (Mick Jagger, Paul McCartney, Tina Turner) by Ronald Prent (THE SCORPIONS, DEF LEPPARD, WITHIN TEMPTATION). Check out the video for "BANG!" right HERE. For the members of GOTTHARD - Nic Maeder (vocals), Leo Leoni (guitar), Marc Lynn (bass), Hena Habegger (drums) and Freddy Scherer (guitar), the dynamic boogie groove of the title track is also new ground for the band, reflecting their unbridled energy and pure confidence. For Maeder, BANG! is not only his second album with GOTTHARD, but also the convincing proof that he belongs in the band, that he has become one of them and his voice and his qualities as a songwriter are indispensable. Title track "BANG! ", the first single off the album, truly represents the GOTTHARD sound and evolution. Catchy hooks, wailing guitars and Maeder's lush vocals grab your ear, making "BANG!" a song you will never forget. These songs are set against a background of classic GOTTHARD rock tunes like Get Up ‘N’ Move On", "Jump The Gun" and "My Belief", which traditionally grace every album by the Swiss combo. All told, BANG! presents a compelling mix that is sure to take its rightful place in the proud legend of GOTTHARD. “You can’t really compare different albums, but if one record comes closest in sound, it is probably Lipservice (2005), except there’s more of a playful feel to BANG! and the arrangements spring one or two surprises,” says Habegger. "Get Up ‘N’ Move On"